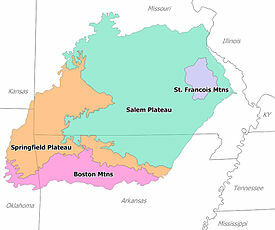 The Ozarks, also called the Ozark Mountains and Ozark Plateau, are a physiographic, geologic, and cultural highland region of the central United States. It covers much of the south half of Missouri and an large portion of northwest and North central Arkansas. The region also goes westward into northeast Oklahoma and extreme southeast Kansas. The name Ozarks comes from the French Aux Arcs. The name means "with bows" and was given by an early French explorer to the Bow Indians (Quapaw). They were native to the area that later became Arkansas. ↑ 1.0 1.1 "Ozark-St. Francis National Forest; Forest Information". United States Department of Agriculture, Forest Service. 2014. Retrieved 19 May 2014. This page was last changed on 22 June 2018, at 11:33.